Tight lines or slack lines? How about semi-slack lines? Heavy bobbins, light bobbins, swingers, springers, cords and chains. How confusing bite indication can be! 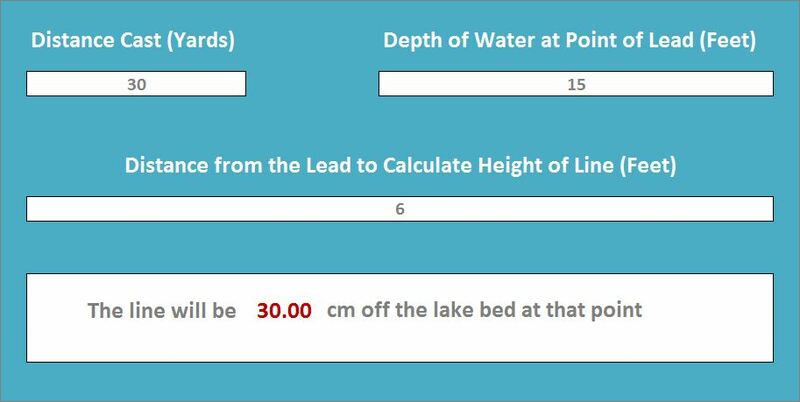 I mentioned in this blog post on this very subject that I’d built a spreadsheet to help me work out how much of my line is likely to be off of the bottom when fishing with a tight line. I regularly hear the words ‘the line will be on the bottom near the lead’ when speaking with anglers fishing tight lines. The thing is, how do they know? The depth of the lake and distance you’re fishing will mean that in certain circumstances they will be right, the line will be on the bottom near the lead but at other times they could be very wrong. The spreadsheet I put together shows worst case presentation and assumes a bow string tight line. If you use a heavy mainline or leader your presentation should be better but the tool does give you an idea to how your line would potentially look to a carp. I said in the post I linked to above that I’d share the tool with you lovely lot and here it is. I’ve also included a step-by-step guide on how to use it. To get free access to the download link and instructions, simply tweet or share my blog with your social followers – this just helps me to spread the word of this blog and you get a clever fishing spreadsheet – everyone’s a winner! The spreadsheet is really easy to use and quite self explanatory. Simply specify how far out you’re fishing (in yards), specify the depth (in feet, where your lead is) and then how far back from the lead you want to see how far off the deck your line will be (in feet). All very simple stuff but I hope it’s useful and will give you a bit more of an insight into your presentation. Posted in Theory on March 4, 2015 by admin. 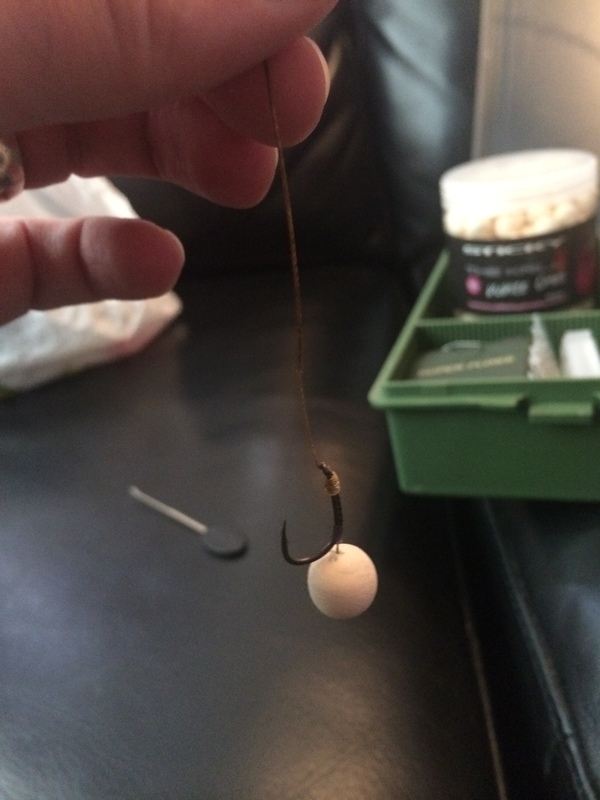 First of all that I just want to say that this rig isn’t my own – Tom Maker showed me how to tie it on a recent tutorial session. It’s amazing how complicated rigs can get, when I first started carp fishing I bought all the mags, watches the DVD’s and tied all sorts of weird and wonderful rigs in the hope that one would catch me a biggie. In reality it just confused the hell out of me and I couldn’t see the wood for the trees. I still don’t fully understand rig mechanics so I carried over a mind-set from my fly fishing – KISS (keep it simple stupid). 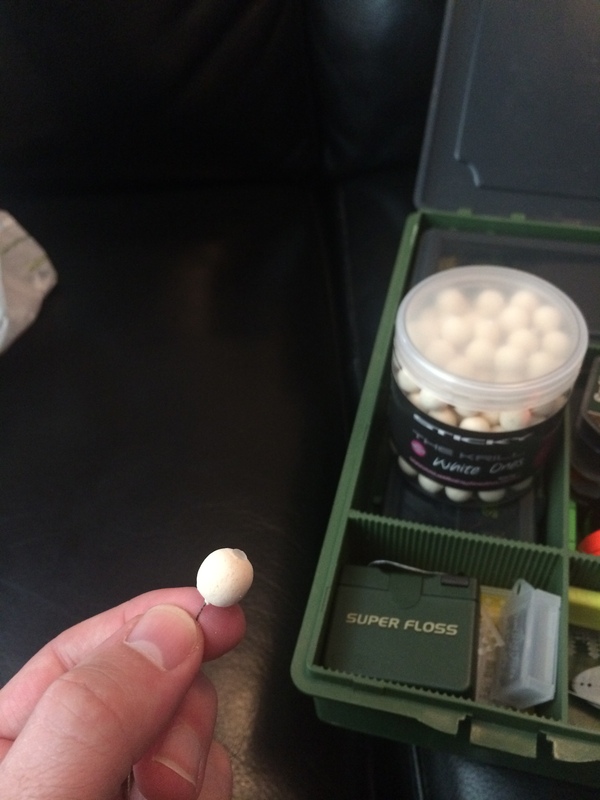 Tom’s rig suited me perfectly – quick and easy to tie and can be used for bottom baits and popups. The other advantage is that when used with a helicopter setup it’s pretty tangle free. Next, tie a small simple overhand loop knot for the hair. I used to tie a perfection loop for my hairs as the hook link material exits the loop right in the centre meaning it’s very neat. Because the hair is always supple though I found that this is unnecessary and an overhand loop gives the same result. I also realised that there was more to life and I was being a bit sad! 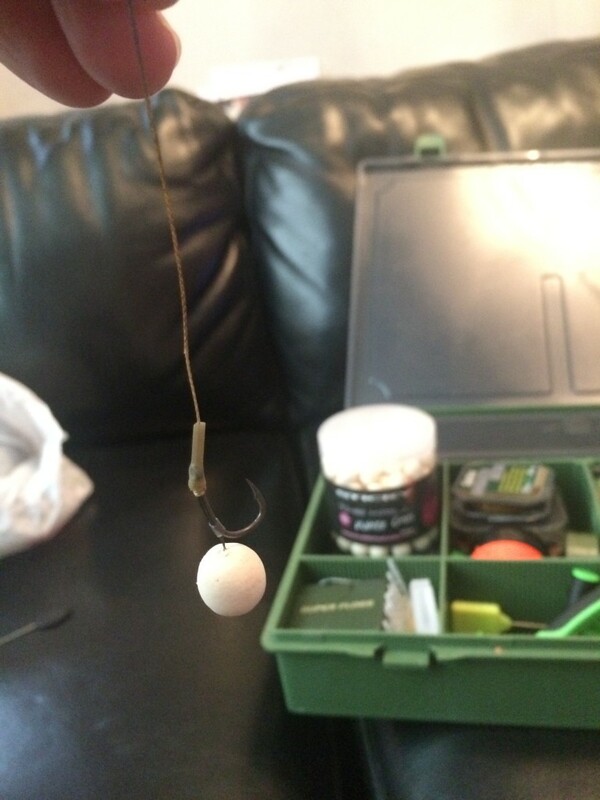 Now slide your chosen hook bait (this is a popup version of the rig, I’m using a 12mm bait here) onto the hair and secure with a boilie stop. I use the Fox boilie caps, as you can see they look very neat. Now the blowback hook silicone goes on. 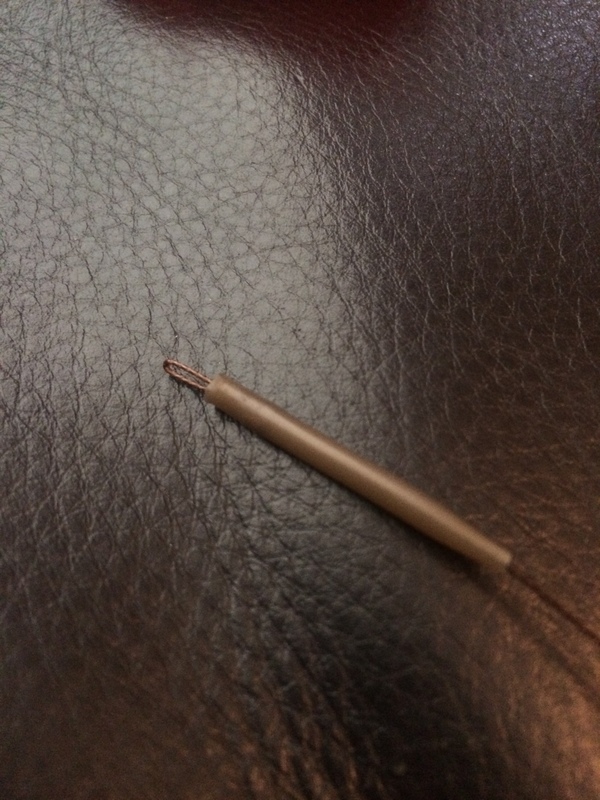 You only need a small piece, maybe 1.5mm – don’t stress too much about this! 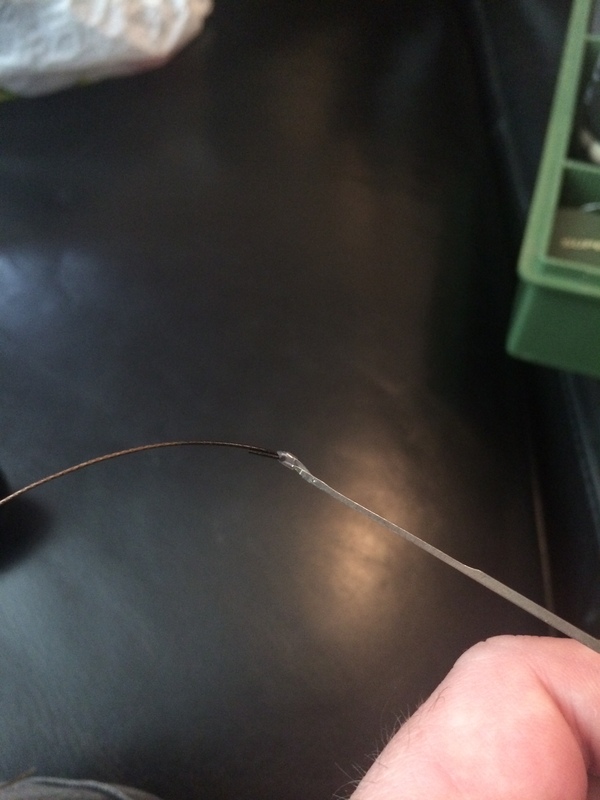 I use a leadcore splicing needle to get this on as it’s almost impossible to push through. Slide the silicone close to the popup and push the hook point through the silicone towards the popup. Slide the silicone around the bend until it’s on top of the shank but just before the bend. Then, push the braid down through the eye and tie a normal knotless knot (I normally use 7 or 8 turns). 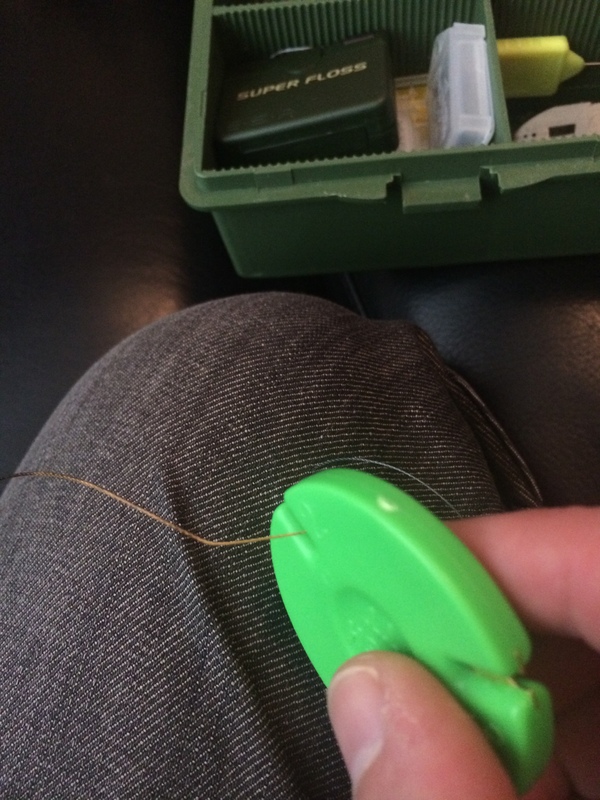 Now it’s time for the tricky part – trying to get the leader silicone over the eye of the hook! Cut a piece about 1cm long and again using the gated splicing needle thread it onto the braid up to the eye. The trick is to grip the braid with the back of your hand while pushing the silicone over the eye with your fingers, it will go on eventually – be careful not to slip at this point as you could end up with a sharp, barbed hook in your hand! The silicone normally stays on even if it’s just pushed over the eye and not down the shank, you may have to use a slightly shorted piece of silicone though if this is as far as you can get it. Now it’s time to add the shot. I’ve used 2 x no8 Stotz here but they were a bit light and I had to mould a bit of putty around them for the popup to sink. I normally use a number 4 shot which is about right but I wanted to try out the Stotz as they looked neat and the biggest the shop had was no8. Whatever size shot and popup you use, you are looking for a very slow sinking bait – perfectly balanced which will sit on top of any light debris on the bottom and also fly into the carps mouth. 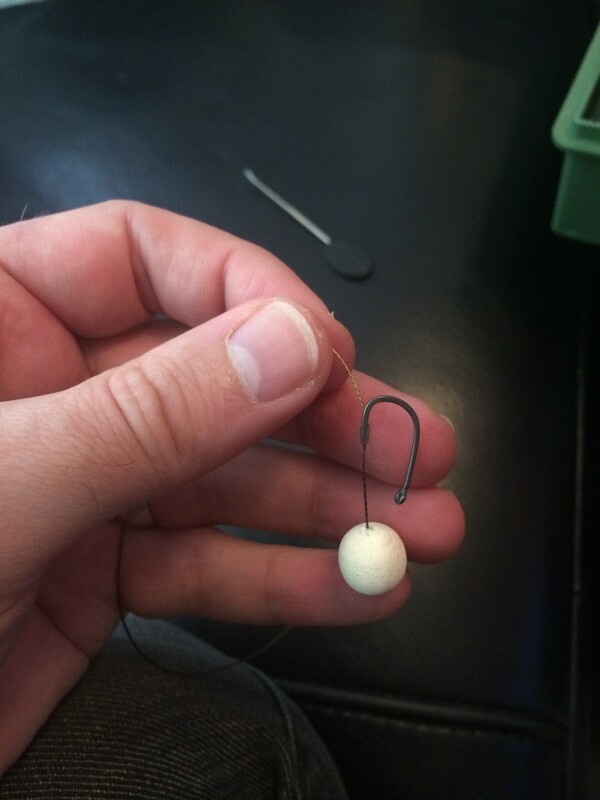 To finish the rig, tie a figure of 8 loop knot at the other end of the hook link for use with a quick change swivel and add a short anti-tangle sleeve. The length of the rig is quite short (5” ish). 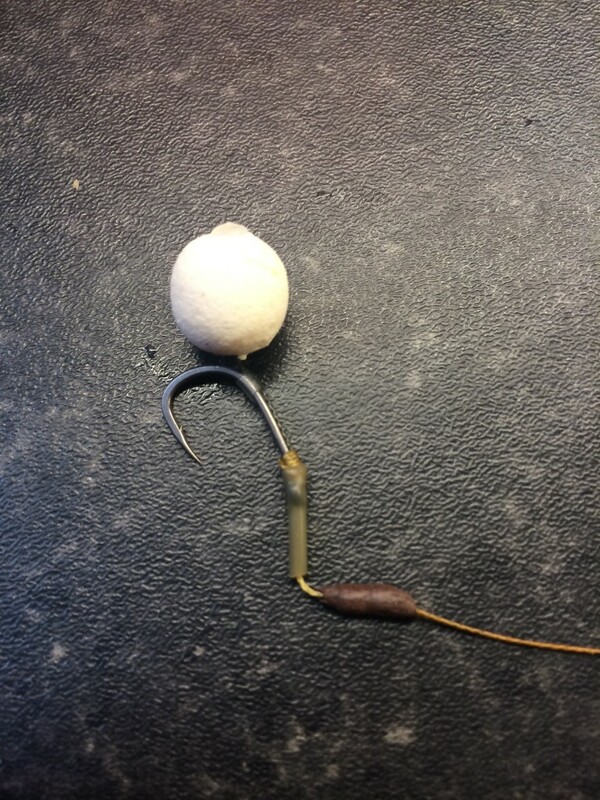 To use as a bottom bait rig simply remove the shot and use a hair extender boilie stop to give you a longer hair. Posted in Theory on September 6, 2014 by admin. 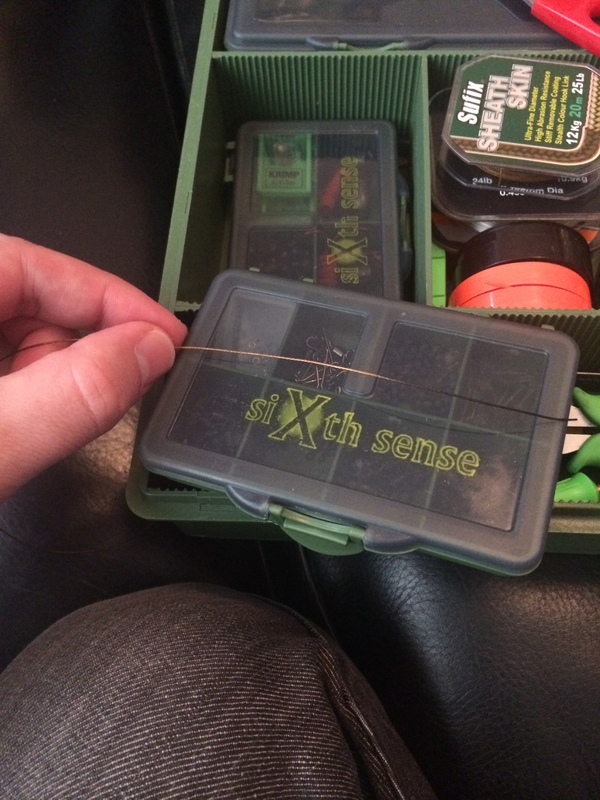 If there’s one thing that divides carp anglers its slack vs tight line fishing. 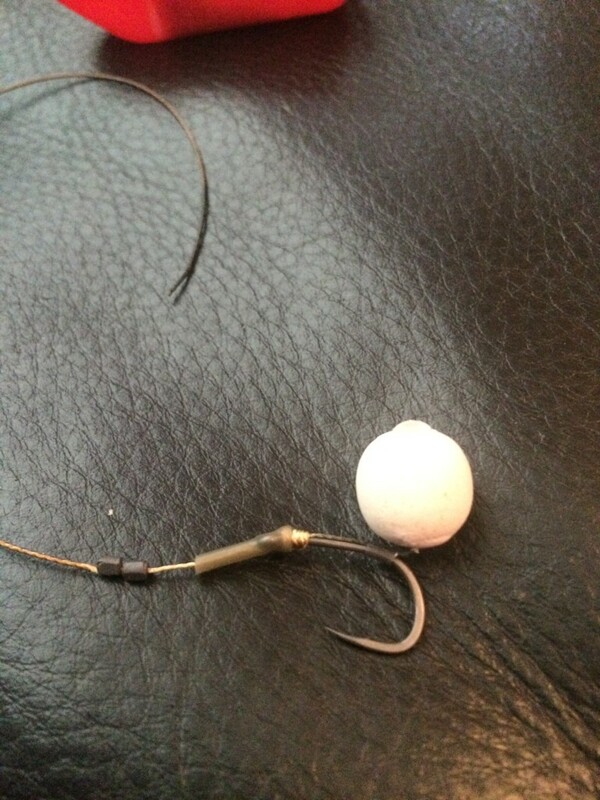 The other thing is barbed vs barbless hooks but we won’t go there right now! The theory behind slack line fishing is that when using a heavy line like fluorocarbon the line will, when sunk lay on the bottom of the lake where the fish can’t see or feel it. People believe that carp will spook off a tight line meaning you have less chance of them taking your hook bait and getting a bite. This is something that drove me mental when I first got into carp fishing – I read as much as I could find on the subject and still struggled to make a decision about what road to go down. I have to confess that I’ve always been biased towards tight line fishing just because that’s how I started doing it before starting to research the negatives and positives of fishing like that. After reading all that material I found that nobody actually described the process between casting out and switching the alarm on. I aim to cover here how I do it – I’m no Dave Lane but I have done my research and come to my own conclusions so you might be able to take something from this post. 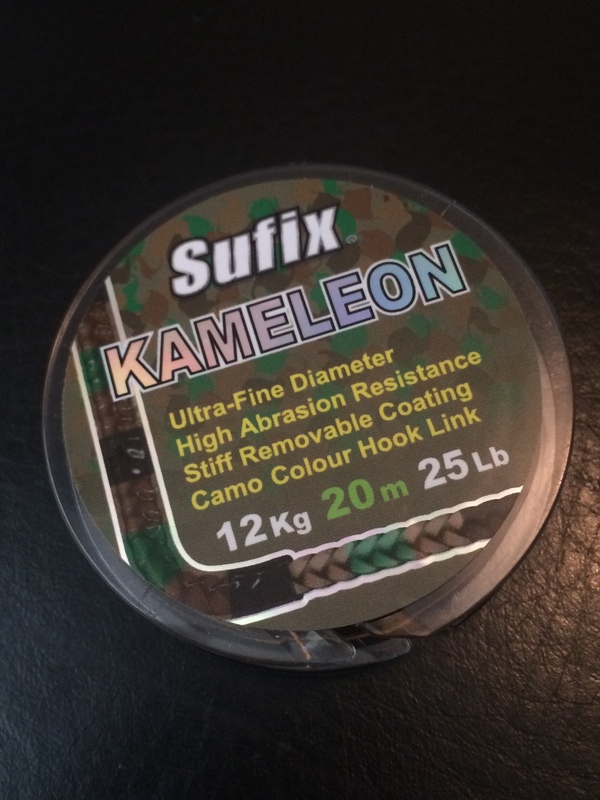 If you’re interested in what line I have used and like, see this post on the best carp fishing line. OK so first of all, let’s see what the pros say about it. That’s 2 very good anglers with completely different opinions – they both catch their fair share of carp! The video from Kevin Nash below is fantastic; this introduces another spanner in the works ‘semi-slack’. As if it needed confusing even more! Nash mentions flying backleads in the video which is another consideration. When I first started thinking about the whole tight vs slack thing a backlead was a possible solution, although it was a clip on one under the rod tips I was looking at. The conclusion I came to was that I’d have better line concealment and it would be easier when playing fish but at what cost to my bite indication? A backlead right under the tip introduces a massive angle in the line and angles in the line are bad for indication. Another thing that put me off using fluorocarbon and fishing slack lines was the whole sinking the line thing, people were quoting 30 minutes for their line to fully sink – seems like a lot of messing about to me! So, after all this I wanted to fish tight lines – no backlead and my rod tips pointing straight at my lead. This would give me the best bite indication and I didn’t have to wait half my session for my lines to sink. Decision made I had to figure out a ‘workflow’. Here is what I do, step-by-step. 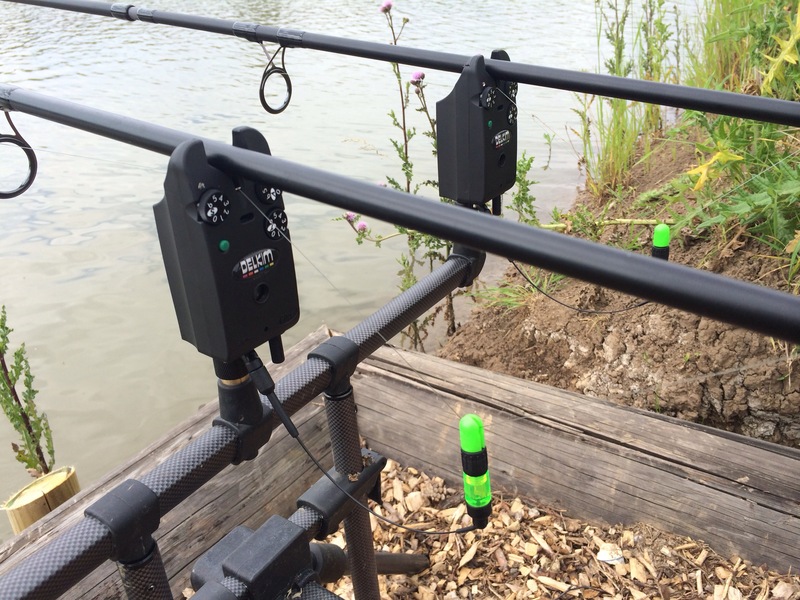 Green bobbins with green Delks – tackle tart! I now use the ball clips instead of the slik clips but other than that, this is how I now setup. I’m fairly happy with how I do things now, the only thing I do wonder about is how much of the line is off the deck near the rig. I’ve started using leadcore to help with this and it all depends how deep the lake is and how far out you’re fishing. If you’re fishing at 30yds in 15ft of water there will be more line off the deck than if you’re fishing at 90yds in 6ft of water. I actually went to the trouble of creating a spreadsheet which calculates this – very sad! I’m hoping to share it on the blog at some point in the future so look out for it (UPDATE – here it is!). Here are the results based on the example figures above. Remember that these are absolute worst case as they don’t take into account any sag in the line due to the weight of it or the leadcore. 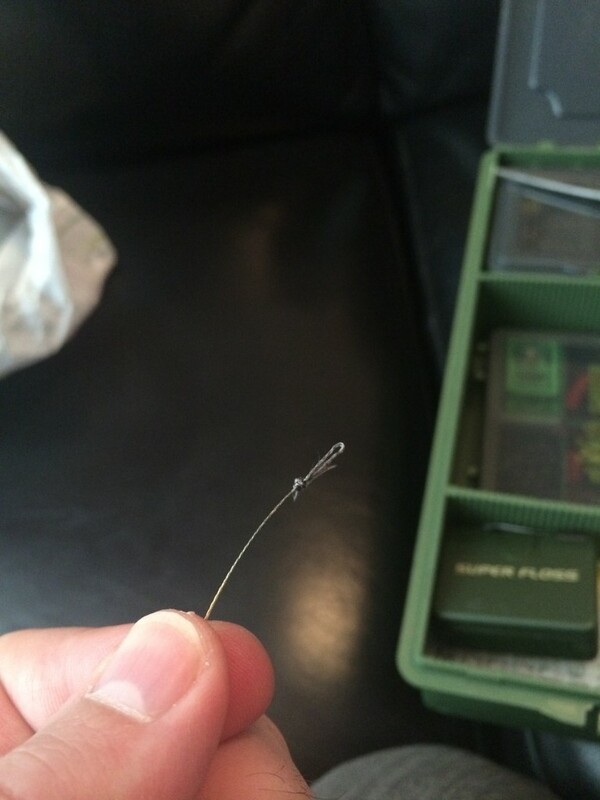 Do carp actually spook off tight lines? If I’m being honest I haven’t observed them enough to know, maybe they do. What if though they actually saw the line and just avoided it – are they more likely to spook off a tight line they couldn’t see? An example which was given to me was that if you were walking down the street and tripped over something you didn’t see it would give you a big old shock, if however you saw a rope at waist height you would simply go around/over/under it and carry on walking. I’ll leave you with a link to a recent blog post by Simon Crow on the same subject. It makes for very interesting reading. Posted in Theory on August 7, 2014 by admin.